Being badass while lacking a name. A lone wanderer makes his way into town that has been divided between two gangs vying for control. He then decides to play the gangs off against each other so the town can finally end its history of gang warfare. Does the plot sound familiar? That is because it’s exactly the same one as Kurosawa’s Yojimbo. Sergio Leone’s A Fistful of Dollars was an almost scene-by-scene remake of Kurosawa’s picture, albeit transplanting the setting to Mexico and replacing Mifune Toshirou with Clint Eastwood. Thus it shouldn’t be a surprise that Kurosawa actually sued Leone on grounds of plagiarism. A Fistful of Dollars is considered a quintessential Spaghetti Western, or a Western filmed by an Italian production team. Like most Spaghetti Westerns, A Fistful of Dollars was made on a pretty obviously modest budget. As a result, the special effects looked pretty unconvincing. The scene that comes to mind is when one of the gangs, disguised as US Army troops, mows down Mexican soldiers with a machine gun in order to steal their gold. There was an instant where even though the gunner was firing, there was no sound effect of the machine gun’s report. Even aside from that, the scene just looked comical with the Mexican soldiers clutching their hearts and dropping melodramatically. Even more so than the special effects, the dialogue looked like it was dubbed in post-production. I think aside from Eastwood, none of the other actors spoke English, so an English dub was necessary. So this movie has a plot ripped off from another movie, cheesy special effects, over the top acting, and English dubbing. That makes A Fistful of Dollars a film destined for the Wal-Mart bargain bin, right? Well, I humbly believe that’s what makes this movie a classic. While A Fistful of Dollars reeked of the shortcuts that plagued other low-budget movies, like just about any martial arts movie to have come out of Hong Kong in the 1980s, this movie just had that something that made it win a place in my heart. I think what Leone had that directors like Godfrey Ho didn’t is some real artistic sincerity, and he was truly just the victim of not having enough money to make a movie true to his vision. At the same time, I think it is the low budget that made A Fistful of Dollars the classic that it is now. Even while suing Leone, Kurosawa himself praised A Fistful of Dollars. Of course one can never forget the epic score that Ennio Morricone wrote for this movie. Basically, I can sum this review up as: You need to see A Fistful of Dollars. Actually, watch Yojimbo first, then watch A Fistful of Dollars. 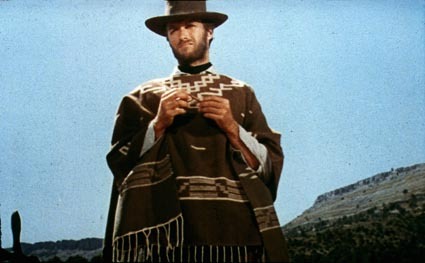 EDIT: I found that the real reason for the post-production dubbing is what I have suspected all along: A Fistful of Dollars was actually filmed with a silent camera, so adding sound later was necessary for that reason, and this further proves the modest budget the film was made with.